Scientists say there's plastic in our poop! It’s polluting our oceans, our communities -- and our bodies. But without public pressure now, some governments will still go easy on the plastics industry. Tell all European governments to support the EU’s ambitious Single-Use Plastics law, and make it stronger still. Tough rules on plastic pollution in Europe could save marine life all over the globe. An overwhelming majority in the European Parliament just voted today to strengthen the EU's plan to cut plastic pollution. Tough rules on single-use plastic items in Europe could save marine life all over the... globe. I wish we could stop to celebrate this historic moment, but there’s still a massive danger ahead: The European Commission has spoken, the European Parliament has now spoken, but Europe’s governments could still make rotten compromises for corporations. Europe's 28 Environment Ministers are meeting next Monday. Now is our time to tell them we want oceans free of plastic pollution, and polluters held accountable for the harm that they cause. Tell all EU governments to support and strengthen the single-use plastics law! It's more urgent than ever to get plastic out of our rivers and seas -- and our bodies. 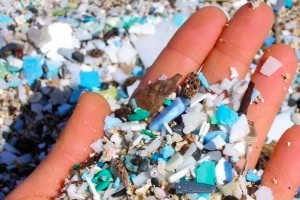 An Austrian study just now revealed the horrifying amount of microplastics that lurk inside our own digestive systems. With this proposed law, the EU can finally put the health and well-being of people and the planet ahead of Coke and Nestlé's profits. But only if European governments hold fast and strengthen the law to make sure that it doesn’t pay to pollute. The struggle against polluting plastics is also the struggle against runaway climate change. The International Energy Agency warned in a report this month, that the single most important driver of global oil demand growth in the next 10 to 15 years is petrochemicals -- which is what 99% of plastics are made from. EU governments: Support and strengthen the single-use plastics law, and make sure the polluters pay! We've already come so far in the fight against the plastic flood. It was the signatures and actions of the SumOfUs community, along with those of our fantastic partners, that helped get the European Commission to propose an ambitious plastics strategy earlier this year. We've got to see this thing through and make sure that corporations can't weasel their way out of the law that gets passed. European Parliament takes historic stand against single-use plastic pollution Rethink Plastic Alliance. 24 October 2018. Rising use of plastics to drive oil demand to 2050: IEA Reuters. 5 October 2018. Microplastics found in human stools for the first time The Guardian. 23 October 2018.